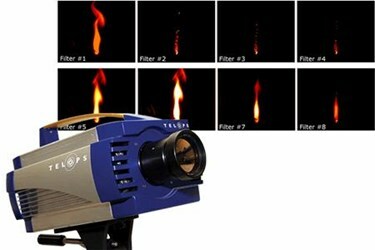 The MS-IR uses a high-speed filter wheel to perform 8-channel multispectral target signature analysis. Its user adjustable rotating speed can go up to 100 Hz, meaning it can support an up to 800 fps frame rate. The camera’s high dynamic range ensures the highest possible contrast and accuracy in the images it captures. The MS-IR can split a scene into eight separate spectral bands. It offers radiometric temperature accuracy of +1oC or +1% over the entire range, and the camera’s high sensitivity allows for the detection of temperature differences as small as 20 mK. These features make it ideal for quartz mineral identification, and methane detection and identification. MW and VLW models are available. Both versions are equipped with an MCT detector. The MW model covers the 3 µm to 4.9 µm spectral range and has 640 x 512 pixel resolution. The VLW version covers the 7.7 µm to 11.8 µm spectral range and has 320 x 256 pixel resolution. For more information on the MS-IR multispectral infrared camera, download the datasheet.